Bvlgari celebrates its 130th anniversary with Opera Prima, a new limited edition fragrance and collector bottle. The Opera Prima, an elegant chypre essence with radiant and feminine notes, is a unique collaboration between two masters of Italian craftsmanship: Bvlgari and Venini. The sculptural bottle, created by the master glassmakers, evokes the ancient Roman amphora which held precious stones, spices and floral essences. 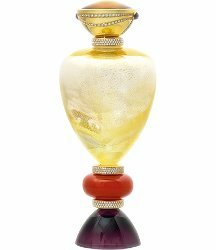 Dazzling in its vivid combination of colours, and embellished with approximately 250 carats of citrine, more than 25 carats of diamonds and over 4.45 carats of amethyst cleverly set in yellow gold, the bottle features a sheet of gold that is melted between different layers of glass. The fragrance, created by master perfumer Daniela Andrier, recalls the essences of the Mediterranean with its notes of citron, lemon and orange flower. You can find it on Bvlgari's 130th anniversary microsite. I am assuming very few (possibly only one) were made, but I do not know how many, nor do I know the size or price. Update: the price is reportedly €260,000. Will it be available at Macy’s???? But of course! And I’m sure it will come with a vinyl cosmetic bag and a sample of Omnia Indian Garnet as a gift-with-purchase. Really?? The jewels are overdone but otherwise, I think it’s gorgeous. It actually looks sort of like a much less elaborate amphora I bought in Venice years ago, then broke. I think it’s gorgeous too, although it does seem like a lot of disparate ideas mashed up together: it reminds me of the bottles for Tocade and White Diamonds and Femme and the urns that Carons come in, among other things. But still, I like. You & I will share it then. Am vaguely curious what it costs, although probably just as well not to know. Yours for only $275,000 ! Pyramus I thought of Tocade too! The top amphora part I like, but everything below it is overkill for me. Robin: diversity of tastes is good, glad you like it, but let’s hope they do a swarovski version for less than 10K!!! Ha…but I would like the whole thing better if they left the jewels out entirely…so make mine plain colored glass for, say, $50? There. I said it. Ew..
Well, mainly because of the red part standing out too much imo. I really love it, except for the red part. It looked to me like they stole that from Moschino’s Cheap & Chic. And they shouldn’t have. Haha! Yet it becomes the absolute opposite: Expensive and Ancient. It’s selling in the United Arab Emirates for 1 million UAE dirhams – which works out at around US$275,000 – start saving ! “Bvlgari’s scent will not be the most expensive on display. Coming in at twice that price is Guerlain’s Le Secret de la Reine – although this will only be available for purchase and will not be present at the show. The perfume is held in a bee-shaped vial that can be worn as a brooch or pendant. The crystal is set with 14 carats of diamonds and more than 500 hours of work went into drawing, cutting, polishing, setting and assembling the Dh2 million piece. Pressing the diamond atomiser that adorns the bee’s chest opens its wings, releasing its fragrance. It is “true luxury”, DFS says. Someone needs to come out with a much less pricy version of this mechanism. I would absolutely buy it unsniffed. The bottle looks unstable, like it would tip over and break if you sneezed near it. If you can afford that bottle, you don’t sneeze. You hire someone to sneeze for you. One small earthquake and it’s all over. CA buyers should have earthquake insurance though:). I think the bottle is exquisite:). In my budget too! lol, looking forward to that gwp at Macy’s!